The BBC's international channel BBC World News celebrates 25 years on air during Friday 11th March. The channel is the BBC's biggest in terms of audience reach. According to figures released by the BBC, BBC World News reaches 85 million viewers every week. 433 million households can receive BBC World News in their channel line-up. Launched in 1991 as BBC World Service Television (WSTV) under the era of John Tusa as World Service Managing Director, the channel was not allowed to be funded by the Foreign Office, and so had to become a commercial enterprise. The launch of the service came on the back of a major turning point for television news. Supported by new technologies, CNN had just shot to fame around the world for its unrivalled coverage of the first Gulf War. The era of rolling television news had arrived, and the BBC wanted to be part of the action. Initially only available in Europe, where it had replaced the BBC TV Europe service, the channel expanded to Asia later in 1991, and then rapidly expanded around the world through the 1990s and early 00s. The original news team comprised six journalists from the World Service team and six from television news. Today, BBC World News has access to the expertise of thousands of journalists based in over a hundred cities and state-of-the-art studios across the world. 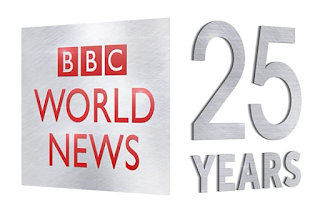 In 1995, the channel became BBC World and in 2008 was renamed once more, this time to BBC World News. Since last year, more of the channel's output can be seen in the UK than ever before. Following cutbacks at the BBC News Channel, up to an hour of World News content is shown at 9pm, led by interactive news show Outside Source from Monday-Thursday and World News Today from Friday to Sunday. BBC World News is simulcast from midnight to 6am on the News Channel and in turn on BBC One for part of that time. BBC Four also simulcasts BBC World News on weekdays at 7pm. With BBC News reportedly needing to find further cost savings, recent rumours have included merging the UK focused BBC News Channel with BBC World News, or at least increasing the number of simulcasts.